Your attack on Chicago's bicyclists is not only inaccurate and misguided, it borders on delusional. The reality is that the purpose of increasing Chicago's bicycling infrastructure was to make Chicago more easily accessible, more affordable and less congested. These are goals that no Chicagoan should oppose. Yet, in spite of these truly noble efforts and the opportunity for "The City That Works" to make this happen, you chose to aim your sights on bicycles and portray bicyclists as free-loading scofflaws. Equally troublesome is that you use the very serious issue of gang-related murder in Chicago as a contrasting issue. This is a simple minded tactic to try and transfer Chicago's residents' real concern about the serious issue of crime overwhelming parts of the city onto Chicago's plans for the development of bicycling infrastructure. As I understand your point, all the money spent on bicycles and bicycle infrastructure by the City of Chicago could otherwise be used to help fund the Chicago Police Department's efforts to fight crime in the city. This same argument could be made about any single line item in the City's budget. 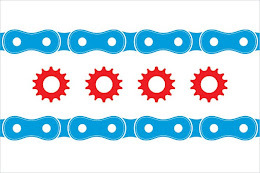 In addition, instead of using your considerable platform to shine light on an issue that does not get the attention a crime wave should, you want to write about bicycles and the relatively minor budget for the development of Chicago's bicycle infrastructure. Shame on you and the Chicago Tribune for printing this nonsense. In the most simple terms I can use, bicycling is a good thing and it is good for Chicago. Bicycling increases citizens' quality of life and their relationship with their city. It also promotes a healthy lifestyle and reduces the number of cars on the roads. Chicago's plans to make itself one of the world's great bicycling cities is the kind of vision that makes this city great. Chicago's master architect, Daniel Burnham, is famously quoted as saying, ""Make no little plans. They have no magic to stir men's blood and probably will not themselves be realized." Chicago, led by Mayor Emanuel, has made no small plans when it comes to bicycling. For that, Chicagoans should be grateful. The violence that currently plagues this great city is a totally separate issue. And one that needs a voice with a powerful platform. Someone like John Kass of the Chicago Tribune, "The World's Greatest Newspaper." Rise to the occasion, Mr. Kass, and fight the good fight. And let Chicago's plans for bicycling be a positive force in this city. We need all the positivity possible.